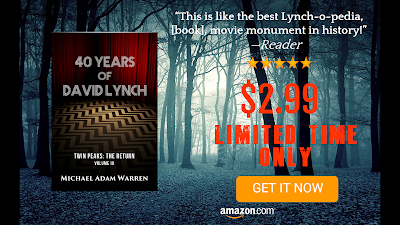 We arrive at the possible conclusion of the 40 Years of David Lynch series with Volume IV: Twin Peaks: The Return! Will David Lynch make more films and TV shows after this? As of today, He has officially declared himself as undecided. But dive deep into the master artist's latest creation with filmmaker Michael Adam Warren as your guide through nuclear blasts, charred lumberjacks, tulpas, doppelgangers, alternate dimensions, time travel, Kafka, and blue roses. And we are definitely going to talk about Judy. Preorder your copy before its release on October 10, 2017! For those unfamiliar with my book series, I posted a commercial for it to give readers an idea of my tone and style. I am an admirer and avid student of David Lynch's work in cinema and television. He is one of the most fascinating artists of our era and my book series is a labor of love to help provide readers with useful analysis of his work and exploration of what it all means. All four volumes are currently available on Amazon via the image links below.